Only in a city such as Rome could the Pantheon be considered quaint. Found in a city containing hundreds of opportunities to view overwhelming ruins, the Roman Pantheon slips dreamily into the landscape. Of all the great buildings constructed during the crest of the Roman Empire, only this one still stands. Seemingly impervious to time or destruction, the walls and dome of the Roman Pantheon rise from Piazza della Rotonda, and bath the square in a warm, protecting light. 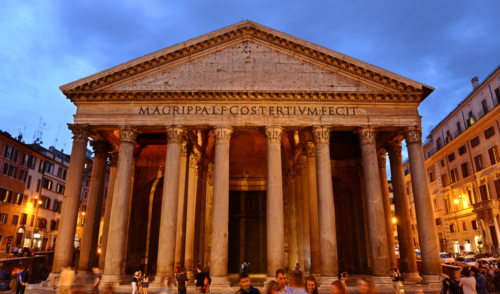 The history of Pantheon dates back to 27 B.C., when it was first conceived by Marcus Agrippa as a temple to the Gods (Pantheon meaning, of course, "all the gods"). Over 150 years later, emperor Hadrian oversaw its completion, and is credited with turning it into one of the most recognizable architectural works in the world. The cavernous space rises 142 feet into the air while its base measures the same - a perfect sphere astride a corresponding cylinder with an immense bronze ceiling. A hole at the dome's apex allows daylight into the majestic main room, a shifting spotlight that slowly fades into twilight and allows no defense against the rain or the occasional Roman snowfall. Pantheon history states that the interior of the roof is intended to symbolize the heavens, and the giant hole above is supposedly the eyes of the gods. A precarious moment in the history of Pantheon was the fall of the Roman Empire. But unlike many institutions at the time, the Roman Pantheon managed to escape destruction as Barbarians flooded the city. Historians disagree as to why the conquerors elected to preserve this building while destroying so many others, and thus their motives may forever remain a mystery. Regardless, it was the pivotal moment in Pantheon history. Beneath the light and between the granite Corinthian columns, seven sculptures stand. These Roman gods correspond to each of the seven planets (at the time) and remain in their original spots, despite the church being consecrated as a Christian church by Pope Boniface IV in 609. But the Roman Pantheon seems to exist independent of religious rule - more a tribute to the past than any specific spiritual figures. The history of Pantheon was forever changed during the reign of Pope Urban VIII, who melted down every scrap of bronze located upon the ceiling, outraging a great deal of Roman citizens. 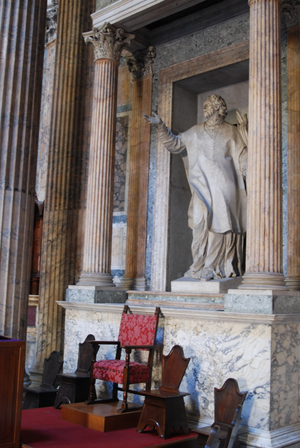 The great bronze doors escaped destruction, however, and remain today, a glowing testament to Pantheon history. 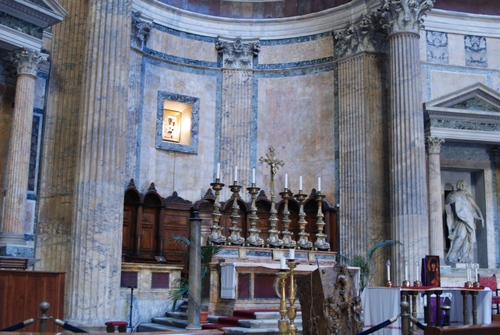 Since the Renaissance the Pantheon has been used as a tomb. Among those buried there are the painters Raphael Sanzio da Urbino and Annibale Carracci, the composer Arcangelo Corelli, and the architect Baldassare Peruzzi. In the 15th century, the Pantheon was adorned with paintings: The best-known is the Annunciation by Melozzo da Forlì. Architects, like Brunelleschi, who used the Pantheon as help when designing the Cathedral of Florence's dome, looked to the Pantheon as inspiration for their works. As the best preserved example of monumental Roman architecture, the Pantheon was enormously influential on European and American architects from the Renaissance to the 19th century. Michelangelo studied the dome before creating the cupola of St. Peter's. The concrete used to create the famous dome is one of the great examples of the progressiveness of Roman culture in the first millennium. In fact, the exact composition of the material is still not known, but appears to be structurally similar to modern day concrete. Well ahead of its time in almost every aspect, the Pantheon is a definite must-see in a city full of them.